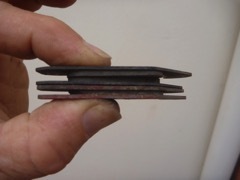 I had replaced the brake pads in New Zealand and had brought the old ones with me and while mending the flat tyres I changed over the pads. It was none too soon. The rear brakes lever now has a very long travel so maybe while changing them I have got air in the lines.